Tip credit reconsideration begins in N.Y. Reconsideration of the tip credit began in New York today with a public hearing that felt more like professional wrestling at times than a serious airing of what’s at stake for restaurants and their employees. So were contentions by female speakers that they’d been subjected to sexual harassment on the job, a dynamic they tied directly to being dependent on tips. “I learned that I am an object,” said Jamine Thomas, a Long Island woman who said she’d been a waitress for half her life, or since age 16. "Eliminating [the] credit would significantly increase the cost of doing business," countered Keith Gutstein, co-chair of the labor and employment group for the law firm Kaufman Dolowich Voluck. "One restaurant client told me that he firmly believes that the elimination of the tip credit would result in such a marked increase in the cost of meals served at his restaurant that he would anticipate a steep decline." A blindfolded attendee might have thought he’d mistakenly wandered into a spirited basketball game between two archrival high school squads. 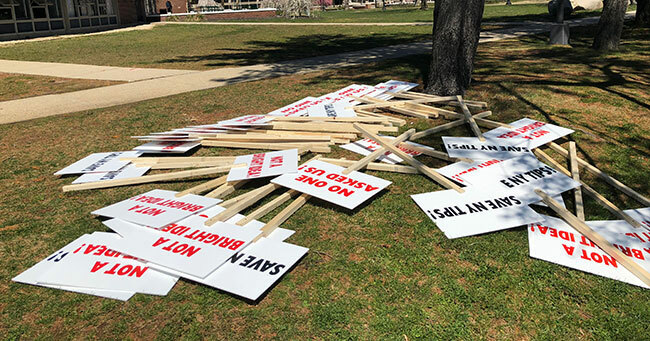 Proponents of ending the state’s tip credit gravitated to one side of the 325-person auditorium, which was filled to capacity, and opponents occupied the other. 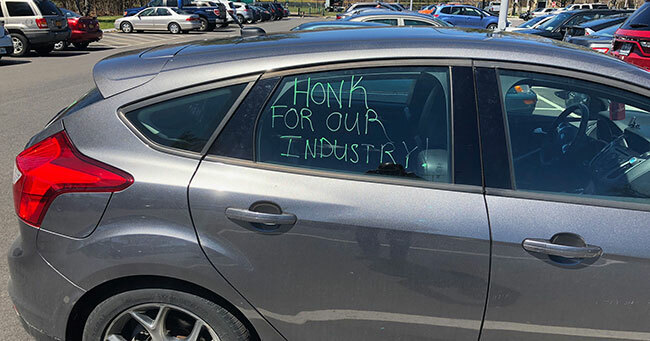 Each side would erupt into cheering and applause when someone from its ranks completed their three minutes of testimony to state labor commissioners on why their respective cause should prevail. If a speaker from the rival camp attempted to go beyond his or her three minutes, the other side hooted and catcalled the transgressor into silence. Among the 154 scheduled speakers, few seemed to be speaking as an unaffiliated individual. Many wore T-shirts identifying them as members of a particular camp. One group, wearing identical tees emblazoned with “Food Workers,” lugged in cartons of boxed lunches for their allies. A fleet of buses parked outside attested to how organized the participants were. One speaker after another identified themselves as members of ROC. Advocates of keeping the credit seemed just as organized. Among the most evident among them were members of Restaurant Workers of America, a group of servers who have banded together in fear a dissolution of the tip credit will cut into their income. 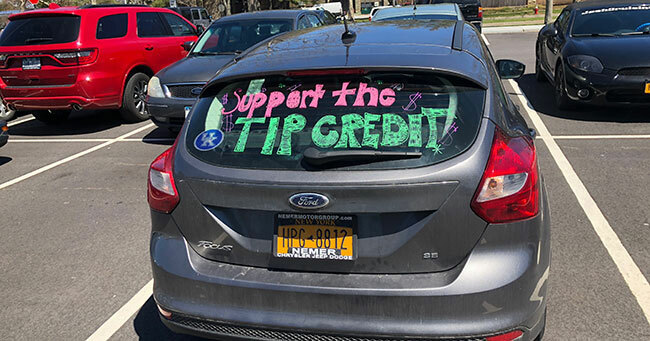 The group grew out of a successful effort in Maine to reinstate the tip credit after residents voted in a referendum to kill it. Milling about in the halls, the groups seemed friendly to one another, perhaps a reflection that so many were servers enjoying a day off from work. 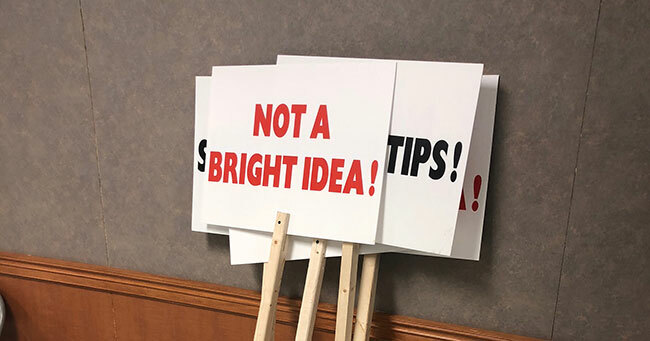 In addition to restaurant employees and employers, stakeholders speaking at the event included nail salon workers, who echoed what restaurant servers said about tipping, and car wash workers. The first hearing was held on the State University of New York campus in Farmingdale, a community on Long Island. Six more are scheduled to be held in various parts of the state between now and June 27. Gov. Andrew Cuomo called for dropping the tip credit in December, calling it one of his major goals for 2018. Cuomo, who is often mentioned as a possible contender for the Democratic Party's 2020 presidential nomination, has been aligned with labor in its call for raising workers' compensation within the state.